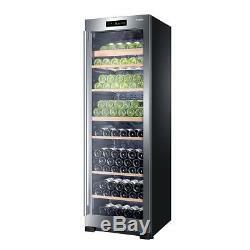 The Haier WS151GDBI is a 151 bottle wine cooler. It features dual zone technology to store your wine at different temperatures and a LED control panel. Low Vibration Compressor The wine cellars compressor has a system that neutralises micro vibrations that are harmful to your wine as well as reducing noise levels. Dual Zone Two distinct temperature zones allow you to store your red and white wines together at their perfect temperatures. Anti-UV Glass Door UV rays are not a friend to your wine. Thanks to the anti-UV filtered glass door, your wines are protected against unwanted light. This enables the aging process to naturally take place and reduces the redox potential. Active Carbon Filter Because your wine breathes through its cork an active carbon filter is necessary to maintain clean air inside your wine cellar. 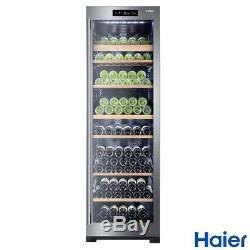 Bottle Capacity: 151 Brand: Haier Colour: Stainless Steel Type: Wine Cooler Dimensions: H 185 x W 59.5 x D 63.5 cm Weight: 92kg. 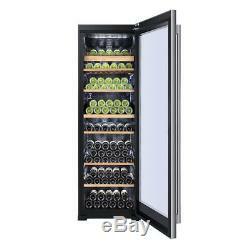 Dual-Zone LED Lighting WS151GDBI 151 Bottle Haier Wine Cooler with Anti-UV Door. Additional day(s) transit may be required for remote areas. There may be some other Post Codes that are affected. There is no local pick-up service. Make sure on receipt of your item you check the packaging to see it is intact and has not been tampered with. Some items we can provide a quote for International Customers. But we do offer a 30 day "no quibble" guarantee. They must be in the condition you received them. We understand the concerns and frustrations you might have, and will do our endeavour to resolve the issues. Please give us the opportunity to resolve any problem. Please check this listing page carefully as the answer is usually there. The item "Dual-Zone LED Lighting WS151GDBI 151 Bottle Haier Wine Cooler with Anti-UV Door" is in sale since Tuesday, December 4, 2018. This item is in the category "Home, Furniture & DIY\Appliances\Fridges & Freezers\Wine Cabinets/Fridges". The seller is "anditsgone" and is located in Southport. This item can be shipped to United Kingdom.